****This is a Fashionista Events Opportunity. Momma Told Me: You are never alone. An estimated 12.5 million Americans are living with, and hopefully fighting, diagnosed cases of cancer. That's 1 in 25 people actively diagnosed with known forms of cancer; whether that be breast, lymphoma, brain, skin, or otherwise. It is a diagnosis so notorious for it's destruction within the human system that the very term is used to describe decay and devastation in numerous non-medical situations. By definition it is the development of unwanted invasive cells, which generally multiply rapidly, and invade normally functioning systems. No race, gender, or age group is immune from this disease, and each variable within the spectrum provides a plethora of medical hurdles for professionals. I am fortunate enough that I live in the United States, where medical care is readily available, even for those unable to pay, and countless organizations are in place to provide compassion and financial assistance for those caught off guard by the illness. Sadly, there are millions worldwide, not as fortunate as I. Places were research now considered old to medical professionals here, is still out of reach physicians. Places where simple pain management for those fighting and suffering, cannot be put in the hands of those in need. I am fortunate that my own personal story is one of triumph; a medical marvel, my mother who fought and came back from stage 4 Hodgkin's Lymphoma in the early 90's. But,no matter how many positive cases we have to celebrate, or the amount of forward movement that is made, Cancer is still a very real threat. New developments for treatment and prevention are being made every day, but only with the financial help of generous donations and fundraising by everyday people such as me and you. Whenever I see an outstretched palm, asking for assistance with such a cause, I am certain to try and help. But giving a dollar here and there simply doesn't seem like it's enough. The number of known cancer cases grows each day, multiplying every year; and the research funding is not limitless. The simple act of spreading awareness can have a profound effect, but you can do even more with a simple procession of steps. The Leukemia and Lymphoma Society holds dozens of events worldwide each year to draw attention for this constant epidemic. 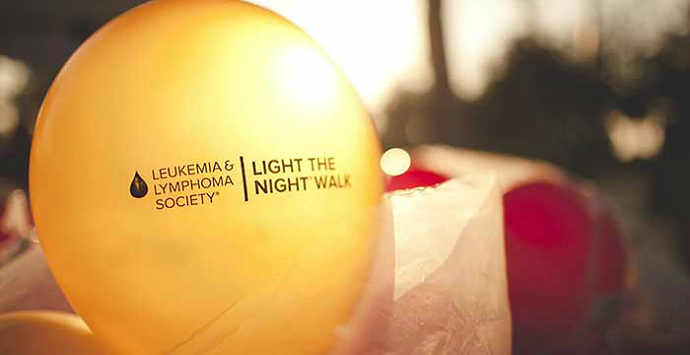 One such event, the Light The Night Walk, now in it's 7th year, is a competition free charitable walk designed to spread awareness and raise money for the search for a cure to cancer. Whether you walk by stroller or cane, all ages are invited to register for a twilight event near them, and proudly walk with an illuminated balloon to show support for this noble cause. Registration is entirely free, and each entrant is encouraged to self fund-raise $100 by requesting donations in exchange for paper balloons. I'm excited to learn there will be an event near me in September, that is still very much in need of help to reach it's goal. It's easy to talk about a topic you have been immediately affected by, but you should not be afraid of fundraising events like this either. Ask with compassion, share your love for the cause, and you'll be amazed at the giving you'll receive! Of course there are many ways to support the LLS (Leukemia Lymphoma Society) reach their ambitious fundraising goals, without even reaching into your pockets. Share the below video on your Facebook and social media channels to encourage awareness for the event and cause. Light The Night is a family friendly event bringing millions together each year, and bringing smiles and hope to the faces of countless previously without. Contact a local business or organization today to see if they are interested in fundraising for an event local to you, or sponsor yourself with paper balloon donations and admission to a Light The Night event. As humans we are strong individuals, but we are unstoppable together! What Daughter Says: Join with us in stomping out Cancer for good. 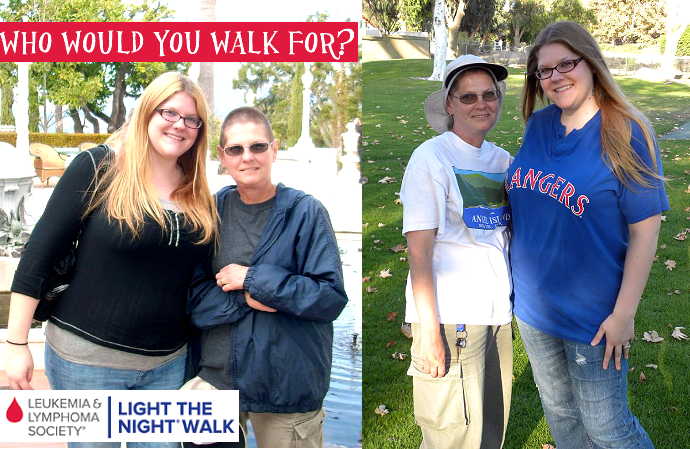 Find a local Light The Night walk near you. What a great cause. I will have to see if there are any around me. Cancer is just awful. I don't know anyone who hasn't been touched in one way or another. There are no Light the Night walks within 30 miles of my home, but I hope that there will be soon. This sounds like a great cause. Wonderful post, so nice to see those shots of your mom, who i have known about all these years. **Waves** to MOM! Fantastic photos. What an amazing experience to share with your mom. I am going to see if I can find one of these walks in my area. Congrats to your mother! Bless her! I am being pretty open with my fight. I was diagnosed with triple negative breast cancer in February. I have since had a double mastectomy and 7 follow up surgeries for complications. Once I am healed all the way, then I will continue treatment with Chemo. My town is having our Walk for cancer here in about 2 weeks, I am not healthy enough to help out this year, but already planning on getting a team together for next year. And already trying to decide on a silly team name...like Rhiannon's Rack Redeemer's! :) It makes me happy to think of doing that next year. I have already had help from the Susan G Komen Foundation in the form of gas cards to be able to drive to all of my appointments, so know that your help does get to people and any support is amazing and makes a person with cancer feel stronger. Love & Hope!